It’s the moment we’ve all been waiting for! Ok, I guess it’s just me that’s been waiting for it, because you guys didn’t even know it was coming. I’ve been wanting to do a giveaway on the blog for some time now, and what better day than my birthday (woohoo!) to kick off Feeding Your Beauty’s first ever prize drawing! I hand-selected these specific ingredients because they are my absolute favorites. The clay, aloe vera gel, and vegetable glycerin come from one of my favorite shops here in Grand Rapids, which sells organic carrier oils, essential oils, cosmetic clay, herbs, and more for making your own DIY natural hair and skin goodies (Moon Drop Herbals, for any of my fellow Michiganders). These are all the exact ingredients I use to whip up my face masks, and what I put on my skin on an everyday basis. These natural ingredients can be used for so many different things, and I’m hoping if you aren’t already a DIY beauty nerd like me, that winning this giveaway is going to commence some serious geeking-out on homemade skin care. I have a ton of ideas for future beauty recipes, utilizing many of these ingredients. I’m talking cleansing grains, homemade shampoos, easy DIY cosmetics, facial toner, detangling spray, and more. I’ve been testing and re-testing and hope to have some ready to share with you soon. In the meantime, a quick google search of these ingredients will have you up to your awe-struck eyeballs in natural beauty instructionals. Bentonite Clay – seriously my favorite beauty clay, ever. When combined with liquid it acts as a sponge/magnet, becoming highly absorbent with a negative electromagnetic charge, sucking up all the toxins it finds on your skin like a miracle vacuum for your face. It’s a dream for acne prone skin, but can make all skin types smooth and radiant. You can even use it on your scalp. Or in toothpaste. Or deodorant. I’m not sure there’s anything this clay can’t do. Google it. Red Moroccan Clay (also known as Rahssoul Clay) – many swear by mineral-rich Moroccan red clay for it’s ability to smooth, tighten, remove excess oil and impurities, and iron out fine lines and wrinkles. Others love it because it is good for sensitive skin. It’s been used for centuries by Moroccan women to enhance skin and hair. It is my second favorite clay, ever. Jojoba Oil – ohh jojoba, how do I love thee? Let me count the ways… You make my skin feel oh-so-soft. You sink it perfectly without being greasy, you’ve even made my pores look invisible and keep me from breaking out. You’re my go-to for oil-cleansing. You work great in so many face masks. I even use a little bit of you on the ends of my hair to tame frizz. Jojoba oil, I love you forever. Vegetable glycerin – vegetable glycerin is a new find for me. It’s a humectant, meaning it attracts moisture, and I like to use it as a replacement for honey in homemade beauty care. It is great for adding bulk, moisture, and thickness to face masks. You can find it in lots of conventional hair and skin care, as well as in tons of DIY recipes. I’m currently working on a shine spray/hair detangler, and most likely vegetable glycerin will be in the mix. Aloe Vera Gel – I love putting aloe vera gel into all kinds of homemade skin products. It’s awesome in masks, toners, face cleanser, and scrubs… aloe vera is healing, soothing, lightly moisturizing, and is an important component for many DIY beauty treatments, even homemade cosmetics. I like to use a small amount as a super simple soft-hold hair gel/frizz tamer. It’s also great on it’s own as a very light, oil-free moisturizer on hot and humid days. Navitas Naturals Raw Cacao Powder – I love this cacao powder! I have several recipes on this site alone with cacao powder, besides the face mask, that involve eating this lovely superfood. Check out alllll the gorgeous benefits of this aromatic face food in my Raw Cacao Face Mask post, and all the great reasons to eat it here. Which brings me to last glorious prize. PASCHA 70% Cacao Dark Organic Chocolate Bar – Because… chocolate. And it’s my birthday. Also, see the links on cacao above. One of you lucky souls is going to have SO. MUCH. FUN whipping up some non-toxic, cruelty-free, all-natural, skin nourishing treats. I’m picturing mother/daughter beauty day, his and hers face masks and massages, bachelorette party/bridal beauty bash, best buds DIY day… the possibilities are endless! Go tell your friends, mom, dad, husband, wife, sisters, brothers, coworkers, etc. to enter the drawing and plan a get-gorgeous day! (Yes, dads, husbands, and brothers want to get gorgeous too. I’m sure of it). Enter the contest below! You have 2 ways to enter the drawing, definitely do both to increase your chances! The giveaway will close at midnight in two weeks, on September 22, 2015. The winner will be announced the next day, and I’ll ask you to send email me your address so I can send you the beauty swag. Good luck! That’s so cute!!! I don’t think my husband would ever attempt that! Your posts are very interesting & insightful. I have difficult skin & your posts give me hope. Your skin looks great by the way! 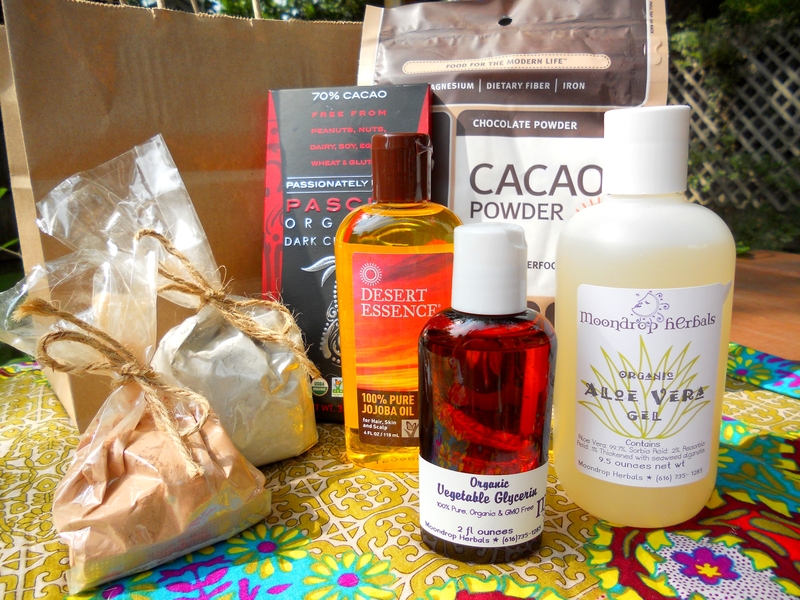 I hope to win the giveaway to jumpstart my natural skin care remedies. How fun! Larice, I like the face mask recipes, and would love any kind of hair mask, especially something to tame frizzy hair in high humidity. Also, which brand of bentonite clay would you recommend? All the clay I’ve seen, including Frontier brand, is a cream color, not gray. I would love to hear your take on natural sunscreens! Are there any you recommend? Hi Kim! Ah! You must’ve been reading my mind, because I was just thinking to myself today…is it too late to do a post on sunscreen? I’ve been meaning to do one all summer! My favorites are Alba Very Emollient sunscreen and Keeki Pure and Simple sunscreen. I also tried Babyganics mineral based sunscreen spray this year for my daughter, and I also used it myself, and really liked it. After reading about chemical sunscreens on ewg.org, I will always use mineral based, natural sunscreens from now on. Their guide to sunscreens is very informational and eye-opening! They also have a searchable database where they rate the toxicity/harmfulness of thousands of cosmetics and skin care. Hope that helps! Thanks for taking the time to comment, much appreciated! Thanks for the suggestion, Donna. This is something I’m always thinking about, as I struggled with acne a long time. I have a few homemade face masks on my beauty page that address acne: Indian Four spice mask, pumpkin probiotic mask, and the bentonite dream skin mask (my favorite). I’m working on a toner for acne-prone skin, and a few other ideas 🙂 Thanks for your feedback! I would LOVE to see natural hair products! I have curly hair and am always on the hunt for products to help battle frizz. Thank you so much for the giveaway! Your blog is always informative and I appreciate that. It shows the hard work you put in to it. This is a very generous giveaway my friend, thank you. I hope you will continue to bless us with your plantbased knowledge. I love your blog posts. Thank you so much, I can’t express how much that comment means to me! I appreciate your kindness and support 😀 Thank you also for sharing this post on your site! Lovely blog and giveaway. I just discovered your blog, but I am always looking for acne skin care recipes! This bentonite clay is something that sounds awesome. I just stumbled across your blog, but I am interested in natural products for dry cracked feet. Mine aren’t what you’re thinking but they’re dry. Hey Stephanie, thanks for stopping by and taking the time to comment! I am currently rocking some dry heels at the moment, and they are probably what you’re thinking. Not pretty! I’ve heard that actually vegetable glycerin is good for this, which is one of the items in the giveaway so I am trying it tonight and will have to report back my success! I think a foot scrub would feel mighty nice too! I’ll be thinking about that one. Thanks again! I love serums. Evening serums for anti-aging. Something to get rid of sportiness – sun spots. A good nourishing mask. A firming mask/serum. A list of ingredients with benefits and potential combinations would be great! Love to learn more about clays!! Happy Birthday!! Love your site especially since I’m trying to use better products for my overall health! !